As the first semester winds down, the Rev. 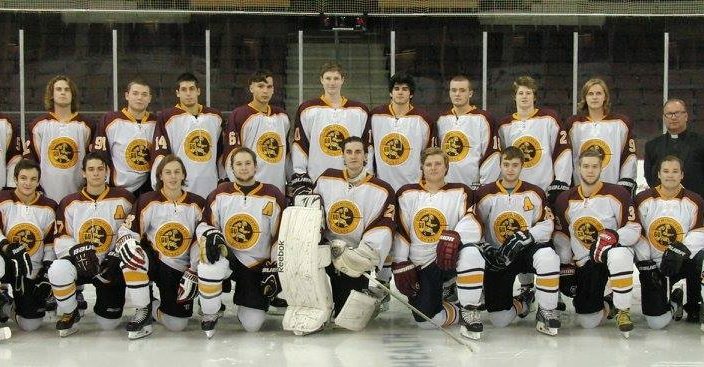 Jason Glover and the Gannon University hockey team are getting ready for a rumbling, tumbling second semester full of more hard-hitting action. This semester has been nothing short of successful for the Knights as they boast a 13-2 record, beat the Erie Eagles for the first time in history and have two goalies, Chadd Turner and Trey Brown, who are two top goalies in the nation, to name a few successes. Let’s start with the game against the Eagles. For the first time in program history Gannon faced off against a National College Prospect Hockey League (NCPHL) team. The Knights came out on top, crushing their opponent, 13-3. Glover and his boys were happy to come away with such a big victory against a team with a lot of talent. “The NCPHL is a relatively new national league that exists to develop hockey players into potential Division I scholarship athletes and to develop players into potential candidates for professional hockey contracts,” Glover said. The Knights aren’t shy about winning by a large deficit. After a 7-4 loss to Penn State Altoona, Gannon, fueled with a desire to win, defeated Community College of Allegheny County, 15-3. In the game against CCAC, Zak Tomblin contributed a hat trick to the Knights’ scoring onslaught. After that, Gannon beat Saint Vincent, 3-2, on Nov. 13 and six days later the Knights shut out Cal U, 5-0. The shutout didn’t come easy as Brown held off 20 of the Vulcans’ shots. Next was arguably the Knights best win of the semester—the win over the Erie Eagles onNov. 30. Sparked by the win over the Eagles, Gannon was able to top the Division II Youngstown State Penguins, 4-2, Friday. Josh Green started the scoring against the Penguins with a goal 10 seconds into the match. The Knights netted another and with the score at 2-1 in favor of Gannon the first period ended. Youngstown tied it up on a power play in the second. Tomblin put the Knights ahead in the third, making the score 3-2 and with 10 seconds left in the match Green completed his hat trick with a third goal. Statistically speaking, Gannon has six players ranked as top scorers in the National Collegiate Hockey Association (NCHA). Zak Thibeault is ranked second, Tomblin third, Patrick Korn is fourth, Green sixth, John Roberts is eighth and Blaine Adams is ranked ninth. Overall, the team is ranked No. 1 in the College Hockey East (CHE) with Penn State Altoona ranked second. Glover sees that rematch being the game of the season. Aside from its loss to Penn State Altoona, Gannon’s other defeat came at the hands of Penn State Behrend. Glover has also beefed up the second semester schedule since he believes the team is strong enough to handle the challenge. Knowing that Gannon would be retaining nearly all of its players from last season, including Green and Tomblin, who now have an additional four semesters of eligibility as grad students at Gannon, and knowing that the Knights were bringing in some very talented freshmen this year, Glover said he intentionally scheduled three very tough, non-league games to prepare his team for the possibility of playing in the National Championship Tournament: Buffalo State, University at Buffalo, and Slippery Rock. He hopes it will prepare the team for tournament play, which he expects the team to be in, and avoid being unprepared like his team was in 2012-13 during his first year as coach. “This year, knowing that nationals could be a real possibility for us, I wanted to schedule these three teams (along with Youngstown State) to see how we would hang,” Glover said. The Knights ended the semester on a good note and look forward to hitting it hard again next semester.